Public works director Manuel Ojeda, who signed off on at least two of the allegedly fraudulent overtime authorization forms, has remained silent on the indictment of three of his supervisors for corruption. The three supervisors — Joseph Mania, 51, of Randolph; Imad Mowaswes, 52, of Clifton; Timothy Hanlon, 30, of Woodland Park — are accused of submitting false overtime forms, timesheets, and tampering with public records. Ojeda’s approval signature is on two overtime authorization forms for Mania and Hanlon dated March 16th, 2015. 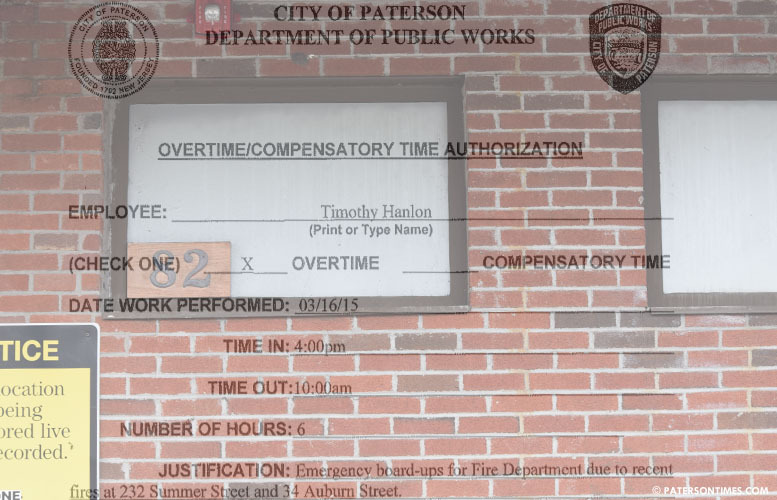 Mania and Hanlon each put in six hours of overtime work that day from 4 p.m. to 10 p.m., according to municipal records provided to the Paterson Times last year. Ojeda did not return multiple calls seeking his comments for this report. A detailed message left at his office went unanswered on Friday afternoon. Ojeda has not been accused of any wrongdoing. Mania and Hanlon appeared on surveillance footage of renovation work being done at 82 East 15th Street captured by a private investigator hired by a local developer. The building was leased by “Quality Beer,” a company formed by indicted mayor Jose “Joey” Torres’ daughter Clarissa Torres and nephew Manuel Torres for a beer distribution facility that failed after unsuccessful attempts to secure state permits and licenses. Hanlon and Mania are captured on video working at the site at 5:46 p.m. on that day. Another public works employee Jorge Makdissi, a carpenter, was also captured on surveillance working at the warehouse. Makdissi allegedly worked at the warehouse that day and billed taxpayers six hours of overtime. Makdissi has not been charged with any wrongdoing. He denied any wrongdoing last year. Hanlon has denied accusation of wrongdoing when the news first broke last March. Mania’s attorney Ray Flood of Hackensack said his client will plead not guilty to the charges. When asked about the accusations against Mania, Flood would not comment on Wednesday when he accompanied his client to the New Jersey State Police Barracks in Totowa for processing. Authorities have said the investigation is ongoing. Mania, who was the maintenance supervisor for public works, signed off on his overtime authorization sheet twice – once as an employee and a second time as division head. He was suspended for 60 days and demoted in October 2016 for vulgar social media postings attacking co-workers. Hanlon’s overtime authorization sheet listed the same justification. His authorization was signed off by Mania as division head and Ojeda as department director. The three indicted supervisors have garnered newspaper attention over the past years for earning large sums of money through overtime pay. Mania collected $116,543 in overtime pay in fiscal years 2015 and 2016. Mowaswes collected $76,437 in that same period. And Hanlon received $75,066 in those two years, according to municipal records. The city has suspended employees charged with wrongdoing in the past. Business administrator Nellie Pou did not respond to a message seeking employment status information on the three public works supervisors. Suspending the three indicted supervisors while their indicted boss continues to work presents a strange dilemma for the city. Torres has called the charges against him “baseless” and has shown no interest in resigning from office.